The beautiful ordinary – For the fainthearted . . .
A florist and greengrocer occupies the undercroft at Langport Town Hall. 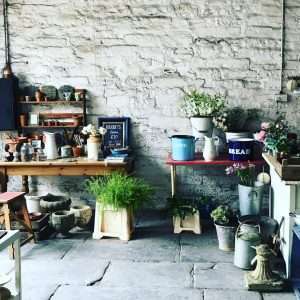 Fresh produce arrives each day, filling the space with aroma and colour, yet there seems a beauty in the equipment used, the tables and the boxes, the pots and the buckets, the vases and the jars. Beauty in a flower or a plant is expected, why else would we buy them? Beauty in the ordinary things mostly passes unnoticed, unremarked. How often would we stop to note the shape or the design or the colour of an everyday piece of furniture? Would we even think it possible that a grey galvanised watering can could be an object that we might stop and ponder? It was the Sixteenth and Seventeenth Centuries before everyday things could be depicted in a way that recognised their beauty. Art in earlier times was chiefly religious subjects. or portraits of the powerful and the wealthy. In the Sixteenth Century, Breughel was among those whose still life painting found their inspiration in things from domestic life. In the Seventeenth Century, it was the work of painters such as Johannes Vermeer, Gabriel Metsu and Pieter de Hooch that celebrated domestic life. Canvases were filled with minute detail of the plush furnishings and intricate craftsmanship of rooms in affluent Dutch households. Of course, the households were idealised and the works were probably more a reflection of those who commissioned than a true representation of the houses in which they were located, but they were a celebration of everyday things. With the advent of photography, art moved away from naturalistic representation, why attempt to do something that could easily be done with a camera? It seems unlikely now that any painter would attempt a contemporary version of one of those Dutch Seventeenth Century works. Still life painting seems chiefly confined to art classes. Perhaps the Dutch painters were the equivalent of today’s glossy interiors magazines, showing households in which the everyday life of ordinary families would be a practical impossibility, but perhaps they also inspired people to take note of ordinary things. To find delight in the commonplace would surely have made daily living something more special? Perhaps we lost some of a sense of the special when we became accustomed to using things and then throwing them away, the plastic and the disposable made domestic objects into things that didn’t merit thought. Perhaps with the passing of throwaway habits, there will be a renewed delight in the things all around us.